Hamsters are rodents belonging to the subfamily Cricetinae. The subfamily contains about 25 species in six or seven genera. They have become established as popular small house pets. They are a bit like a mouse. Wild hamsters live in the desert, but people all over the world keep domesticated hamsters as pets. In the wild, hamsters are crepuscular and stay underground during the day. They feed on seeds, fruits, and vegetation, and occasionally eat burrowing insects. Hamsters are distinguished by their large cheek pouches, and relatively short tail. They use their long cheek pouches (extending to their shoulders) to carry food back to their burrows. 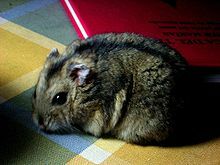 There are six main types of hamsters: the Syrian hamster (the kind most people have as pets), winter whites, campbells, the Russian dwarf hamster (a hybrid of winter white and campbell hamsters), winter whites and campbells are two type of Russian ( despite what many pet shops say), the Chinese hamster, and the Roborovski hamster. The Chinese hamster has a long tail. All Syrian hamsters are the descendants of 12 baby hamsters found in Syria in 1930. Pet hamsters like to live in cages with wood shavings or recycled newspaper (only if non-toxic). Fluffy bedding is dangerous for hamsters. Plain toilet paper is also a cheap, safe option, but not straw as it is very dry and they may choke on it. Hamsters eat mostly hamster food sold at a pet shop, but they also eat almost any vegetables and fruits in very tiny portions. Hamsters store food in natural pouches in the sides of their mouths. Because they are rodents, Hamster incisors grow constantly. They need wooden blocks and hard food to prevent the teeth from growing too much. Most hamsters also have a wheel to run on for exercise. A 6 inch (15 cm) wheel is recommended for most dwarf hamsters, and at least an eight-inch (20 cm) wheel for Syrians. Some people get other kinds of exercise equipment for their hamsters, like a "hamster ball" in which the hamster can roll around the floor, or a long network of tubes with air holes for it to crawl through. They should live in an aquarium (without water) or cage. Hamsters are not recommended for young children. Wikispecies has information on: Cricetinae. Wikimedia Commons has media related to Cricetinae.